An elaborate altar sat in the corner of the La Casa Latino Cultural Center. It was draped in a bright, multicolored blanket and displayed yellow flowers, candles, a glass, a pair of glasses and a cross made of flowers. Bright, decorative paper hung from the ceiling and framed photos sat on the altar. The altar was part of the Día de Los Muertos celebration Wednesday night at La Casa. Día de Los Muertos is a holiday celebrated in Latino countries that honors the lives of family and friends who have died. These altars, a significant part of the celebration, include symbols of air, earth, water and fire, like candles and paper. “It’s all about life and remembering our loved ones, friends, family and community,” professor Mintzi Martinez-Rivera said, addressing the large group that gathered. The altar assembled at La Casa honored a staff member’s mother who recently died. Martinez-Rivera said the event offered students a space to celebrate, especially since they are away from home, and a place to celebrate with a community and family. La Casa was packed with people viewing the altar, eating food and talking with each other. People crowded around the first floor of La Casa, and when food was served, a line continued outside the door. They served traditional food including pan de muerto, a sweet bread served during Día de los Muertos; tamales; tacos; and rice. IU student Lupita Munoz said she came to embrace the traditions, to be with other people and especially for the food. This year, La Casa partnered with the First Nations Educational and Cultural Center; Gay, Lesbian, Bisexual and Transgender Student Support Services; and the Canterbury House to expand its celebration and tie in different communities. People dressed in skeleton costumes helped guide attendees to the surrounding centers. Martinez-Rivera said Día de Los Muertos has transformed for the Latino population in the United States. 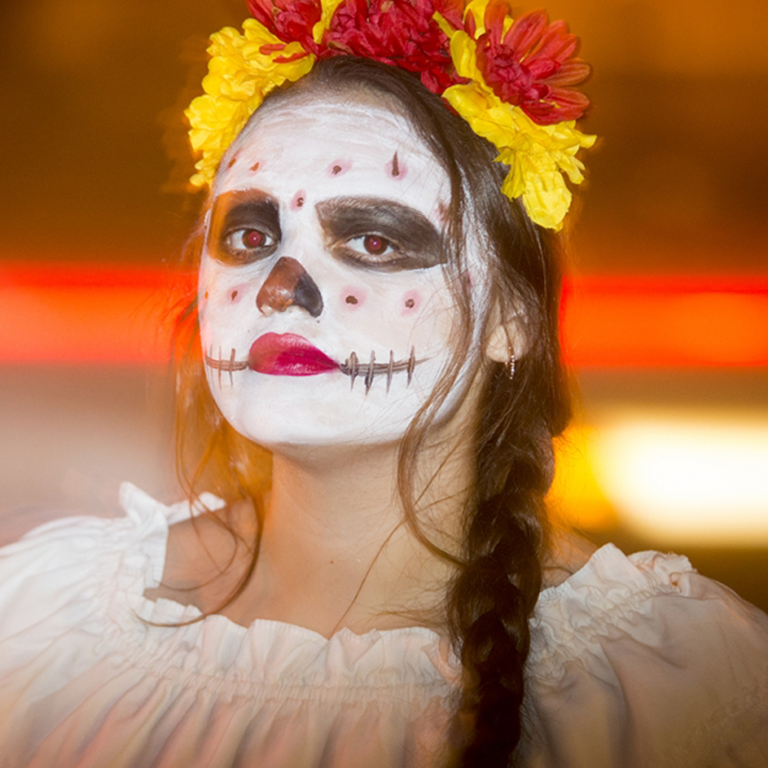 The experience of growing up and living in the U.S. has moved Día de Los Muertos beyond just a Latino or Mexican celebration to include and be embraced by other communities. GLBT Student Support Services had a coloring activity. Its altar featured a remembrance of the victims of the Orlando, Florida, shooting this year. The sense of strong community and inclusion was present at La Casa. Patricia Cornejo, an IU student, said she has not met other Latinos at IU and wanted to come celebrate with others. Cornejo said at home, her mom makes an altar and decorates it with photos of loved ones, similar to how La Casa assembled theirs. Munoz said she usually attends church and puts up photos of her grandparents on Día de Los Muertos. “In Mexico, it’s a really big event and tradition for us,” she said.